Republicans in the US Senate have blocked President Barack Obama's jobs bill in a procedural vote. Forty-six Republican senators joined with two Democrats to filibuster the $447bn (£287bn) package. Reacting to the vote, Mr Obama said: "Tonight's vote is by no means the end of this fight." Republicans oppose the measure citing its spending to stimulate the economy and its tax rise on millionaires. The US unemployment rate is jammed at 9.1%. The package failed by a vote of 50 to 49, short of the 60 votes it needed to advance in the 100-member Senate. The president has spent several weeks promoting the jobs bill in a campaign-style tour across the country. But despite his efforts, he did not pick up a single Republican vote in the Democratic-controlled Senate on Tuesday. Democrats Ben Nelson of Nebraska and Jon Tester of Montana, facing re-election next year in conservative states, also voted against the measure. The American Jobs Act includes $175bn in infrastructure spending and aid for local governments to avoid layoffs, as well as Social Security payroll tax cuts for workers and businesses. Adopting a defiant tone after the vote, Mr Obama said he would work with Democratic Senate Majority Leader Harry Reid to see that individual proposals in the bill gained a vote as soon as possible. The president told a union audience earlier in Pittsburgh, Pennsylvania. "I think they'll have a hard time explaining why they voted no on this bill - other than the fact that I proposed it." Mr Obama has cited independent economists as estimating the American Jobs Act could create up to 1.9m jobs. Analysts say that among the elements of the bill which might be salvaged are a payroll tax cut which Mr Obama wants to extend. Another part of the package that could that attract bipartisan support could be extending unemployment benefits for the long-term jobless. But the package's proposals for increased highway spending and aid for cash-strapped states are deemed unlikely to pick up Republican support. After Tuesday's appearance in Pennsylvania, Mr Obama travelled to Florida for fundraising, and a beer with four unemployed construction workers to discuss jobs. The president told the group - three pipe-fitters and a plumber - at an Irish pub in downtown Orlando that he was trying to figure out how to help the building industry. 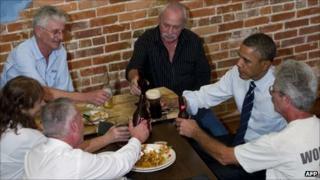 The tradesmen drank Budweiser and Mr Obama had a Guinness as they all toasted: "To more jobs!" Democrats say that Republicans are more interested in defeating Mr Obama than helping the country recover from the deepest recession since the 1930s. But Republicans, who back a job-creation agenda focusing on loosening business regulations, say Mr Obama's jobs bill is a re-run of his 2009 stimulus. Almost 45% of the 14 million jobless Americans have been out of work for six months or more.